Obesity is the most common nutritional disorder, particularly among the affluent, all over the world. Obesity may be described as a condition characterized by excessive deposition of fat in the body. It usually results from consumption of food in excess of physiological needs. Millions of rupees are spent every year on weight loss programs and in most cases there is strong tendency to regain weight. Obese children are often referred to as "chubby". The best way to determine if your child is suffering from obesity is to call a child-specialist doctor and have him diagnose your child. It is fact that children naturally have higher levels of fat than adults, what is often referred to in layman's terms, as "baby fat", and this is perfectly natural. However, obesity is often accompanied by several other factors: chronic hunger, lethargy, and poor physical coordination. One of the simplest causes of obesity is, ironically, rooted in a parent's misplaced love for their child. No one wants their kids to be undernourished; yet in a mistaken effort to overcompensate, sometimes parents wind up overfeeding their children. The problem here is that children need a certain amount of nutrition every day to grow up healthy; anything beyond this limit is stored in their bodies as excess weight. 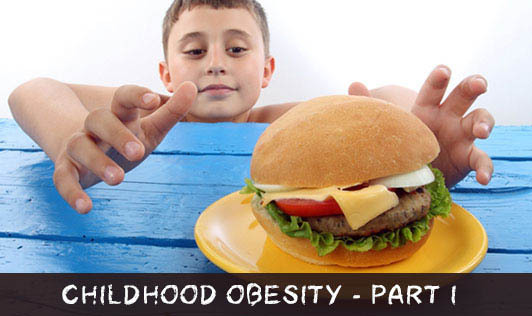 Another common factor leading to obesity in kids is the sheer amount of unhealthy junk food around the world today. Given their often-busy schedules, parents usually let their children gorge on fast food or take-out. While these meals help in filling up their stomach, the excess calories from it gets stored up as fat. If any of your kids suffer from childhood obesity, singling out his problems would only work to his and your disadvantage. At a young age, your child still doesn't have the maturity to understand and accept weight loss needs and goals. Furthermore, medical professionals do not advocate strict dieting for children either. If you want to help your child overcome his weight problems early on in life, the whole family must be prepared to tackle it together immediately.